John and I have been living in Taiwan since 2006, and we generally travel off the island for our Chinese New Year vacation. This year, we decided to stay in Taiwan and head back to Kenting in Southern Taiwan, a place that we haven’t been to since February 2007. 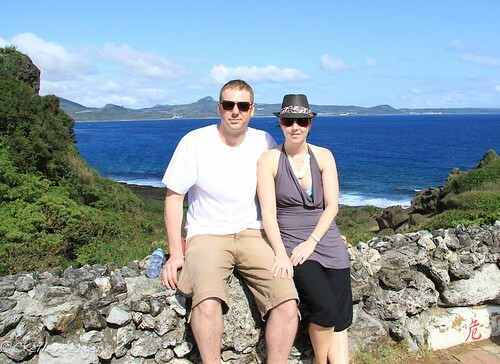 Rather than spend all of our time at the beach, we decided to get out and about to explore Kenting National Park. One of the first places we headed to was Maobitou Scenic Area, mainly because I was so intrigued by the photos that I’ve seen of the area. Also, if you’re a Life of Pi fan, you’ll be interested to know that the Mexico beach scene was filmed at Baisha Bay Beach in Kenting National Park, which is right next to Maobitou Scenic Area. 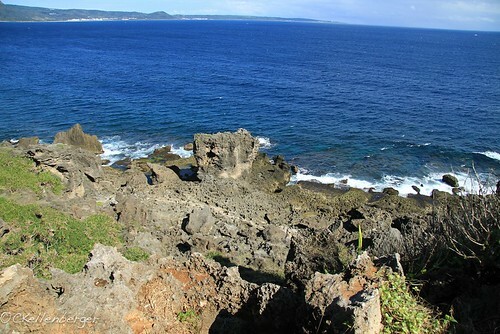 To get there, head north toward Hengchun on Kenting Rd (for about 2 or 3km) and turn left at the 7/11 (road 153). Follow the sign that says Maobitou or Fishing Harbour. Taiwan is well known for its unusual coastline. There are a number of stunning scenic recreational areas all around the island that feature interesting rocky formations and rugged terrain. The most noteworthy being Yehliu Geopark, in my opinion. Nevertheless, Maobitou didn’t fail to impress me. One of two promontories that form the southernmost part f Taiwan, Maobitou doesn’t reach as far south as Eluanbi, but it’s famous for another reason. 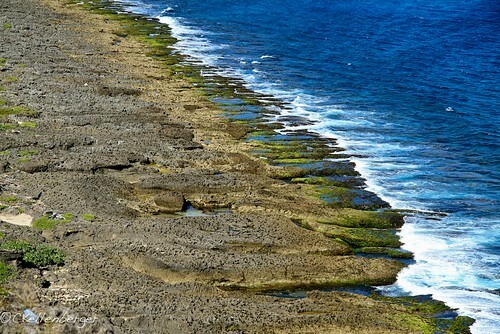 The terrain of this limestone reef coast is said to resemble the form of a crouching cat looking out to sea, and the rocky formations have been formed by the movement of water. The famous coat’s head rock formation. Local fisherman used to refer to this prominent cape as a nose (“bi” in Chinese). The point was called Maobitou – Mao(cat), bi(nose), tou(head) – which translates to “cat’s nose”. While I failed to distinguish a cat’s form from the rest of the rocky formations in the area, the area is undeniably beautiful. 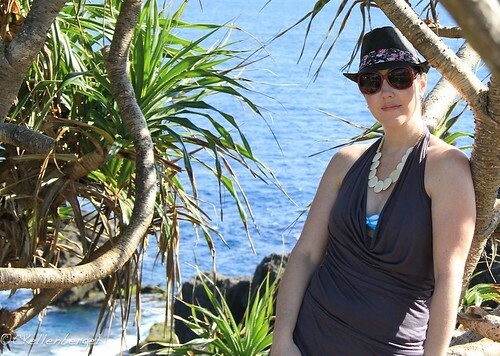 I’ve never seen water so blue before, and the beautiful skirt-like coral reef terraces are just stunning to look at. The pavilion at the top of Maobitou allows visitors to look across the length of Kenting’s southern coastline and the hills that rise above it. You can also get a good view of Skirt Coast and other geological formations in the area. 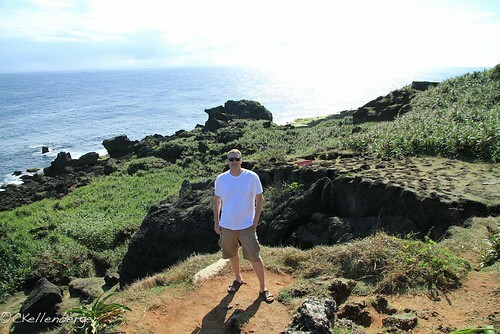 Getting there: Moabitou is a 20-minute drive from the town of Kenting. Follow Provincial Route No. 26 from Hengchun until you reach Mt. Ma-an. Take Road No. 153, which leads straight to the coast. Follow the signs from there. Admission: NT$40 per car. The cost of your admission goes towards keeping the park area clean and staffed. Maobitou’s skirt-like coral reef terraces. Can you spot the person walking along it? I couldn’t resist the photo opp. Southern Taiwan is beautifully warm and tropical as you can see. Gorgeous day ma cheri! Thank you for all the details on the place. Love the scenery! I was able to visit Taipei for a short press trip and while on the tour bus, I saw a number of interesting clips about the other destinations in Taiwan. I want to explore the Northern and Southern part so bad! Hoping to fly back soon! It’s lovely, for sure. But that’s what I love about Taiwan. There are uncovered gems waiting all over the island for the unsuspecting traveler. When are you coming back? Are you coming back soon?